A powerful reminder of why albums matter. 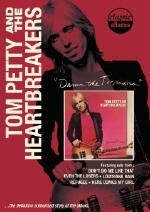 The new documentary that chronicles the making of Damn The Torpedoes, the 1979 breakthrough release from Tom Petty & The Heartbreakers, is a great inside look at the creative process behind an outstanding album. It also reveals a lot about why the Heartbreakers outlasted almost all of their contemporaries. The first two releases from the Heartbreakers achieved only modest success but got the attention of producer Jimmy Iovine (John Lennon, Bruce Springsteen), who brought in Engineer Shelly Yakus (John Lennon, Dire Straits, Van Morrison, Bob Seger) to work on the band's third release. Both were blown away by the songwriting and vocals of Petty and the unique sound the band was creating. Iovine, Yakus, Petty, Mike Campbell and Benmont Tench give wonderful accounts of how the project developed, with a lot of the dialog involving Petty, Iovine and Campbell taking place while the three sit at at the recording console isolating vocal and instrumental tracks from the original sessions to make their points. What emerges is a full picture not only of the making of the record, but also of the creative dynamic within the band. The spontaneous interaction gives you a good sense of how intense but comfortable the process must have been. The respect and regard members of the band have for each other also comes through. Members of most bands that have stayed together as long as the Heartbreakers avoid being in the company of one another a moment longer than they have to be. They convene only to tour, do only old songs and leave in separate limos, tour busses or jets. Not only are Petty and company continuing to make new music together, they seem to still love the process. The account of how this album was made and how it was received is also makes the case for how important albums were in forming a lasting bond between bands and fans. Individual track downloads are like one night stands. It wasn't just the top couple of tracks on Damn The Torpedoes that made millions of people Tom Petty fans - it was the brilliance of the whole damn album.